What is Brazilian music for someone who has never had any contact with the culture. and how do people from around the world understand it? And how do Brazilian star musicians get their voice heard around the globe? After all, a lot of foreigners believe that all of Brazilian music is sung by some lady wearing a hat full of fruit. Unfortunately, due to the way Brazilian culture is exported and packaged, a lot of people around the world have an incomplete view of Brazil. English, however, despite it’s negative reputation as the force of globalization, has served as Brazil’s cultural bridge to the rest of the world. To spread their art, communicate their culture, and connect with the rest of the world, some of Brazil’s top music icons have composed and performed some, and in some cases all, of their work in English. At least the lady with a hat full of fruit is singing in English. Little did I know that Brazil was filled with musical talent and unique styles and sounds which can only be found here in this great land of mixed cultural influence. From Samba to Bossa Nova, Frevo to Maracatu, Forro to Baile Funk, and a vast range of great bands and musicians from Banda Calypso to Michel Telo… ok, maybe not those last two, but you get my point. When I first came to Brazil and starting listening to these styles of music, I was so surprised that I hadn’t been exposed to them earlier. I told some of my friends back home to start listening to some Gilberto Gill, Seu Jorge, O Rappa etc, but none of them could really enjoy the songs as much as I did. Whether that was due to their cultural ignorance, or that they couldn’t understand the lyrics, I can’t tell you. For me most Brazilian Music has a special connection to the people, a feeling of togetherness, something which most foreigners who haven’t spent much time in Brazil can’t quite grasp or feel a part of. And without a doubt, understanding and reflecting upon the lyrics gives my experiences a lot more depth. The first musician, whose music I’m going to go through with you today is Gilberto Gil. Although he has only produced one album in English, which was never very successful, I really admire him as a musician, and have always thought of him as being a very symbolic musician in Brazil. In his exile from Brazil during the military dictatorship, Gil was exposed to reggae music, amongst other styles, and has very diligently put that on his repertoire of musical styles. Gill went on to produce the album “Kaya N’Gan Daya,” in which he covered many of Bob Marley’s greatest songs in Portuguese. What I didn’t know then that I recently discovered was that Renato Russo also recorded an album in English. The name of the album is “The Stonewall Celebration Concert,” and it was recorded in 1994. As I am happily living in this great city of Belo Horizonte, I can’t forget these Mineiro head banging legends. Sepultura, probably being one of the most famous Brazilian bands outside of Brazil, has sold over 20 million records around the world, and have gained multiple gold and platinum records. Sepultura was founded by two Belohorizontinos, Max and Igor Caveileira, and their main influence was the English heavy metal band “Venom.” Their style is a mixture of death metal with a thrashing punk-like guitar style, in addition to some elements of tribal percussion. The song we’re going to listen to is Roots, Bloody Roots. is a song of protest telling us to preserve and be proud of our roots. One interpretation of the lyrics is that he is referring to Brazilian roots and the enslavement of Africans, an dark and bloody part of Brazil’s history. Now a band I have only recently started listening to, “Little Joy.” Although I’m not very familiar with their music, I have enjoyed all of their songs I’ve heard so far after being introduced to this band by several members from the Real Life English Community. The lead singer/guitarist from the band is Los Hermanos lead singer, Rodrigo Amarante, who is well-accompanied by Fabrizio Moretti, the drummer of the American rock band “The Strokes.” This band was formed in Los Angeles in 2007, and has become very popular in the United States. They’re known for its upbeat, relaxed vibe. Let’s look at some of the lyrics from one of their most popular songs. There you have it, 4 great songs in 4 different musical styles all coming from Brazilian roots. As the international language, English is not only the most influential bridge for business, but also for culture. This is how the pop and rock and MPB stars get their voice heard in the 4 corners of the world. Now it’s really easy to take advantage and use it to learn English and share your culture with other nationalities. 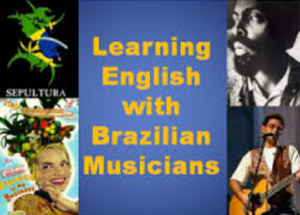 I hope you’ve enjoyed this guide to learning English with Brazilians musicians, and we’d love it if you could introduce us to more on the RealLife English Facebook page. Real Lifers, How do you feel when you listen to these songs? Is it a good thing that these artists are singing in another language? Or do you prefer Portuguese sung songs? Let us know what you think. Dude, I enjoyed a lot your article! Nice stuff! It´s nice to see Brazilian music spread around the world and people apprecaite what the lyrics are saying! I think its cool listening to Brazilians singing in English. There are too many Americans and Brits who sing in English, its nice to mix things up a bit with different accents.